Apple loves giving its new gadgets TouchID. Apple loves it so much, sometimes it's the only thing it adds, but Macs have yet to receive any TouchID love. That's where FingerKey steps in. 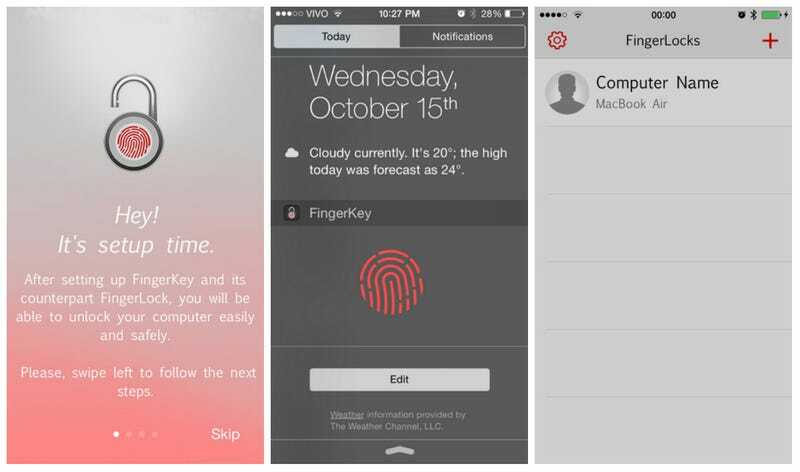 Right now for only iOS and Macs (though Windows and Linux are in development), FingerKey is a $2 app that lets you login to a Mac using the fingerprint sensor embedded in iPhone 5s, 6, and 6 Plus. The password is shared between devices using AES 256 bits encryption, which is the highest key length for that standard. FingerKey and FingerLock, the Mac companion app, work together to give you unlocked access to several different computers. You can also access the TouchID widget in the notifications pane for quick login (thus skipping the extra step of having to launch the app, etc). The app uses Apple's third-party TouchID access in iOS 8 and joins similar apps, such as Knock, which also lets you unlock your Mac (and on a wider range of devices) for $4. So if you've always wanted a TouchID experience on your Mac, you've got options, but it doesn't bring quite the polish that Apple could with hardware integration. We can always keep hoping though.